On Monday the Pellet Fuels Institute submitted extensive comments outlining its position on the inclusion of minimum pellet fuel requirements in the New Source Performance Standards, a piece of federal regulation aimed at improving air quality. These submitted comments were our latest salvo in a regulatory fight that began nearly four years ago. For large portions of 2017 and 2018, this regulatory debate hung in a sort of suspended animation. In November the debate was jumpstarted once again when the EPA published some amendments, advance notice of potential rulemaking and a request for comments on a handful of other items including the issue of greatest interest for our membership and pellet producers around the country, the inclusion of minimum pellet fuel requirements in the regulation. What I think is most important and probably the most difficult aspect of our effort is the importance of establishing that the Pellet Fuels Institute is not opposed to minimum pellet fuel requirements or an established level of pellet quality. What we are opposed to is our product being treated differently than other solid fuel types in our category within a piece of federal regulation. Just because wood pellets are an engineered product with measurable attributes does not justify their inclusion in federal law. I urge and invite each of you to read the comments prepared and submitted on your behalf. They are impressive, well-considered, articulate and thorough. Fair warning, I found myself needing to read them more than once to fully comprehend them. What I can assure you is that point-by-point, our comments make it clear that the EPA does not have the legal authority to include these minimum requirements in the regulation and has not established how their inclusion will result in reduced emissions. What happens now is anyone’s guess. The pellet fuel requirements are simply one aspect of the regulation open for comments. Our partners in the appliance and hearth retailing community are weighing in and closely watching the sell-through provisions. All told, there were thousands of comments submitted for this regulation, and all will have to be considered and responded to and, as everyone is well aware, the federal government is currently shut down. So for now, we’ve done what we can and what we needed to do. As this process moves forward you can count on the Pellet Wire to keep you up to speed on what’s happened and what it means for our industry. Become a 2019 PFI Sponsor Now! Don't miss the opportunity to sponsor PFI in 2019! Sponsorship at all levels brings many perks, along with exposure for your company to the pellet fuels industry. By signing up to sponsor the association early in 2019, you will reap the benefits throughout the coming year. PFI's membership list includes more than 100 companies, and the Pellet Wire, our electronic newsletter, is sent to close to 2,000 subscribers every week. Now is the time to become a sponsor of this organization. Visit our website to explore how you can become involved. We're building a collection of photos of our members, their pellets mills and product. Send them to Carrie Annand at [email protected]. 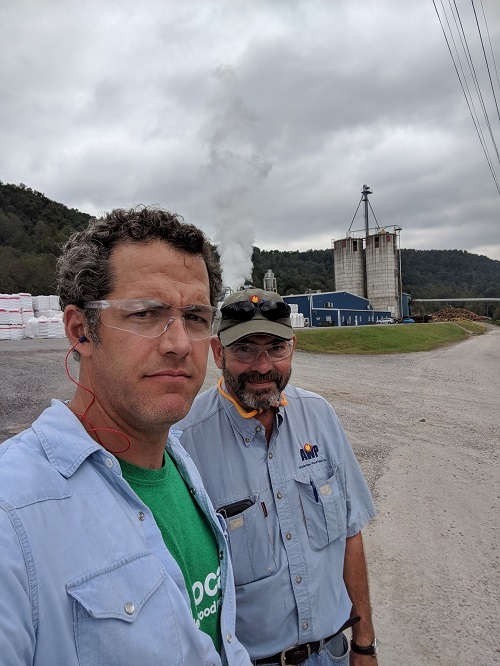 This week’s featured photo, of Tim Portz with PFI Chairman Don Wagner, is from Tim Portz’s visit to Appalachian Wood Pellets last fall. Send Carrie Annand via email at [email protected] news or other ideas to post on LinkedIn. Please be in touch with Carrie Annand via email at [email protected] with information on your company's growth, job openings, promotions, or other news. Thanks for Your Continued Support of PFI! Not a member yet? Learn more about how PFI can work for you and join today! If you think you are getting this message in error, please contact the PFI Office at [email protected]. Critics hope an analysis of the pellet industry’s effects on carbon sinks and emissions could influence the biomass debate. Undaunted by critics, biomass company Enviva is bidding to make North Carolina the country’s top exporter of wood pellets, a popular coal substitute in Europe whose purported climate benefits have come under increasing scrutiny. For years, environmental advocates and many scientists here have fought toxic air pollution from pellet mills and tried to rebut claims that wood pellets are carbon neutral — both with limited success. Two new wood pellet facilities in South Mississippi are expected to bring hundreds of jobs and economic growth to Jackson and George counties. George County announced Monday that the board of supervisors voted to build a $140 million wood pellet facility at the county’s Industrial Park. That move, which has been in the works for years, is expected to create 90 new full-time jobs, 300 construction jobs, and an estimated 300 indirect jobs in the timber and transportation industry. It’s an agreement with Enviva Wood Pellets, the largest producer of wood pellets in the world. But the economic growth is not stopping at the production plant in George County. On Jan. 14, the Pellet Fuels Institute continued its ongoing effort to eliminate the inclusion of minimum pellet fuel requirements in the New Source Performance Standard by submitting written comments to the U.S. EPA prior to the comment deadline.